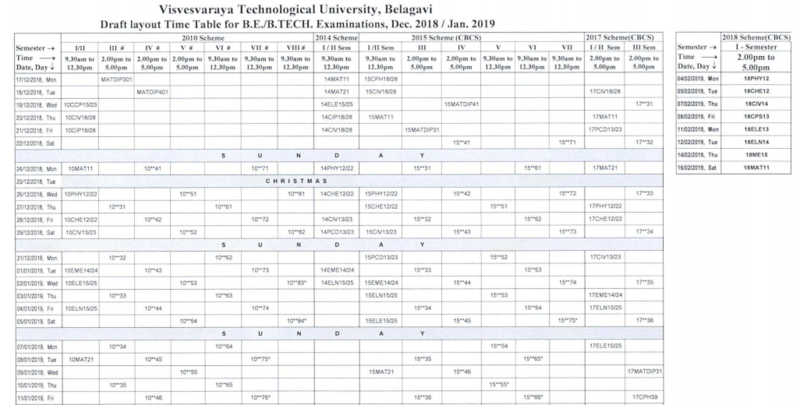 The draft layout timetables of the University examinations to be held at the end of the odd semesters (December 2018 / January 2019) of Bachelor of Engineering/ Bachelor of Technology/ Master of Technology/ MBA/ Master of Computer Application courses are published on the VTU website for the perusal and comments of all the people concerned. 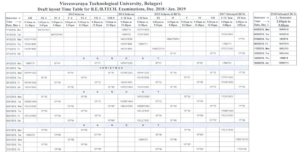 Under circular and notification section, apart from Time Table of VTU December and January 2019 PDF, board has got something new for the students that are – The students admitted under the 2015-16 scheme (i.e. CBCS Scheme) who are not eligible to 5th Semester are requesting for supplementary examination, carryover system and extension of One Time Exit Scheme facility.